With its exploration of the scientific and technological characteristics of systems exploiting molecular recognition between synthetic materials, such as polymers and nanoparticles, and biological entities, this is a truly multidisciplinary book bridging chemistry, life sciences, pharmacology and medicine. 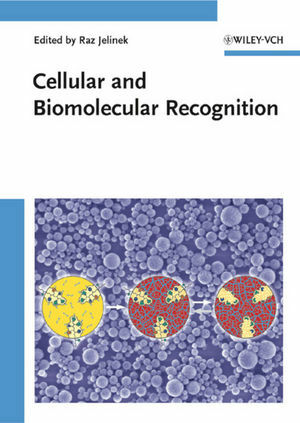 The authors introduce innovative biomimetic chemical assemblies which constitute platforms for recruitment of cellular components or biological molecules, while also focusing on physical, chemical, and biological aspects of biomolecular recognition. The diverse applications covered include biosensors, cell adhesion, synthetic receptors, cell patterning, bioactive nanoparticles, and drug design. Currently at the department of chemistry at Ben Gurion University, Israel, Raz Jelinek obtained his BSc in chemistry from the Hebrew University of Jerusalem, Israel, and his PhD from the University of California, Berkeley. He was a Cancer Research Institute post-doctoral fellow at the University of Pennsylvania, and is currently a Visiting Professor at the Department of Chemical and Biomolecular Engineering at Johns Hopkins University. Professor Jelinek has over 80 scientific publications and 10 patents to his name, and has received several scientific awards, including the Roger-Siegel-Brown Award of the Israeli Academy of Science and the Ruth L. Kirschstein National Research Service Award of the National Institutes of Health, USA.